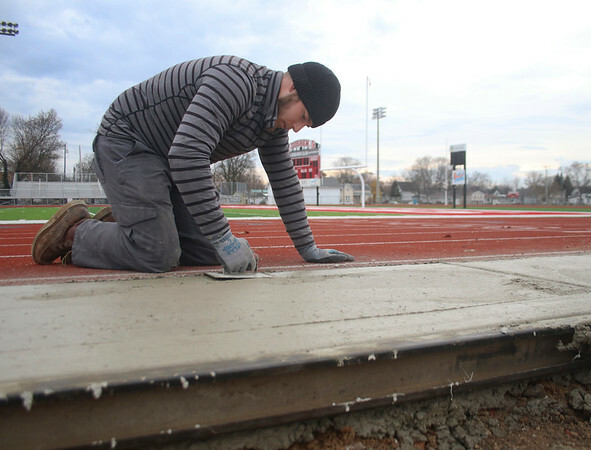 BEN MIKESELL | THE GOSHEN NEWS Tom Denlinger of Elkhart smooths out a concrete sidewalk Monday afternoon at Goshen High School's Foreman Field, prior to the installation of the field's new bleachers. His family's business, J.L. Denlinger Concrete, spent the afternoon flattening and grooving lines in the new sidewalk. The $900,000 replacement plan for the bleachers was approved in August, and is slated to be complete in the spring.